Josie Morgan, East Clinton statistician, was honored during a Senior Night ceremony Tuesday evening at ECHS. LEES CREEK – The East Clinton wrestling team dropped a 54-3 match to Clermont Northeastern Tuesday night at the EC gym. Josie Morgan, East Clinton statistician, was honored during a Senior Night ceremony. On the mat, East Clinton’s lone win came from John Cline, a 6-2 decision over David Pride. “Cline had a tough match and was trailing 2-1 in the final period before getting a reversal and putting his opponent on his back,” Stehlin said. 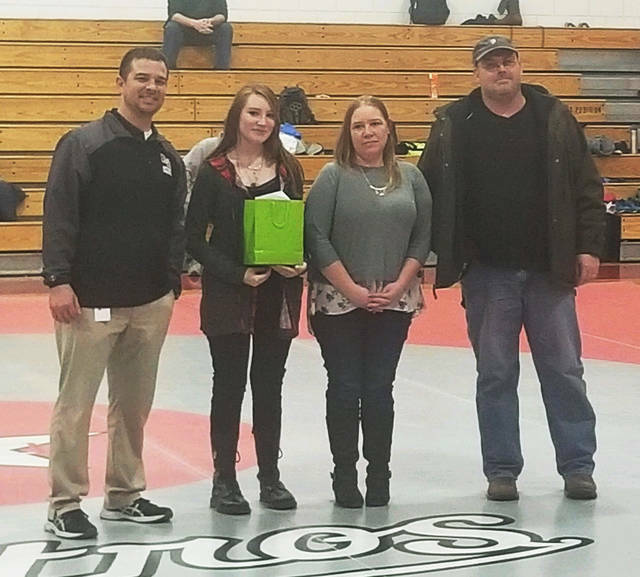 https://www.wnewsj.com/wp-content/uploads/sites/22/2019/01/web1_138292.jpegJosie Morgan, East Clinton statistician, was honored during a Senior Night ceremony Tuesday evening at ECHS.